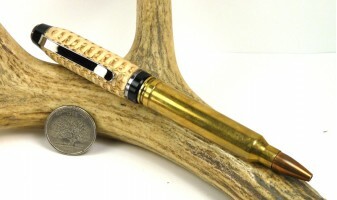 Made from an actual once fired .300 Winchester magnum cartridge with a real solid copper bullet as the nib. The .300 Winchester Magnum (known as .300 Win Mag) is a popular, belted, bottlenecked magnum rifle cartridge that was introduced by Winchester Repeating Arms Company in 1963 as a member of the family of Winchester Magnum cartridges. The .300 Winchester is extremely versatile and has been adopted by many shooting disciplines. The cartridge has found use by hunters, target shooters, military units, and law enforcement departments. Hunters found that the cartridge was an effective all round hunting cartridge. The .300 Win Mag remains the most popular .30 caliber magnum with American hunters, despite being surpassed in performance by the more powerful .300 Weatherby Magnum and the newer .300 Remington Ultra Magnum.